True Path of the Ninja is the first authoritative translation in English of the Shoninki—the famous 17th century ninja training manual. Antony Cummins and Yoshie Minami worked closely with Dr. Nakashima Atsumi, author of the most comprehensive modern Japanese version of the Shoninki, thus making this English translation the closest to the original scrolls. 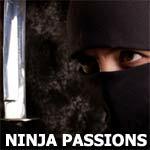 The information and insights found in this translation are invaluable for understanding the skills, techniques and mentality of the historical ninja. Whether it involved tips for surviving in the wild, advice on intelligence-gathering techniques, or methods for creating chaos in the enemy camp, the True Path of the Ninja unveils secrets long lost. Also included is the first written record of the oral tradition "Defense Against a Ninja" taught by Otake Risuke, the revered sensei of the legendary Katori Shinto Ryu school of swordsmanship. It reveals for the first time the traditional teachings on how the samurai can protect himself from the cunning wiles of a ninja.